No one wants to stereotype against Millennials, but they are different from people from previous generations. They grew up with computers and easily accessed smartphone technology when it moved into vogue. Early in their adulthood, many Millennials had to deal with a tremendous economic recession. Many Millennials are in their early 30s these days, and many have acquired significant assets through their occupations or through inheritance. As such, they are the subject of interest of financial advisors who can assist them in the investment strategies that would hopefully increase their portfolio. Spectrem’s study Asset Allocation, Portfolios and Primary Providers examines the average portfolio of investors from different wealth segments and compares them to each other through further segmentations into age, gender, occupation and advisor dependency. The differences between investors based on age are among the widest and most telling for advisor knowledge. An examination of the research shows not only how Millennials differ from Gen X investors and Baby Boomers, but helps advisors understand that investors do transition from one pattern or method of distributing investable assets to another over time. The Millionaire segment of the Spectrem study looks at investment habits of investors with a net worth (not including primary residence) between $1 million and $5 million. The Millennials in that segment have 49 percent of their total assets assigned to investable assets, and that percentage grows to 51 percent for Gen Xers, 58 percent for Baby Boomers and 66 percent for World War II investors. So what are Millennials dedicating their assets to that older investors are not? The answer is their own business. Sixteen percent of Millennial total assets go to their privately held business, and 10 percent goes to insurance and annuities, both higher percentages than older investors turn over to those factors. (Millennials also have far fewer of their total assets assigned to their principal residence. That is one area that changes over time as investors age). 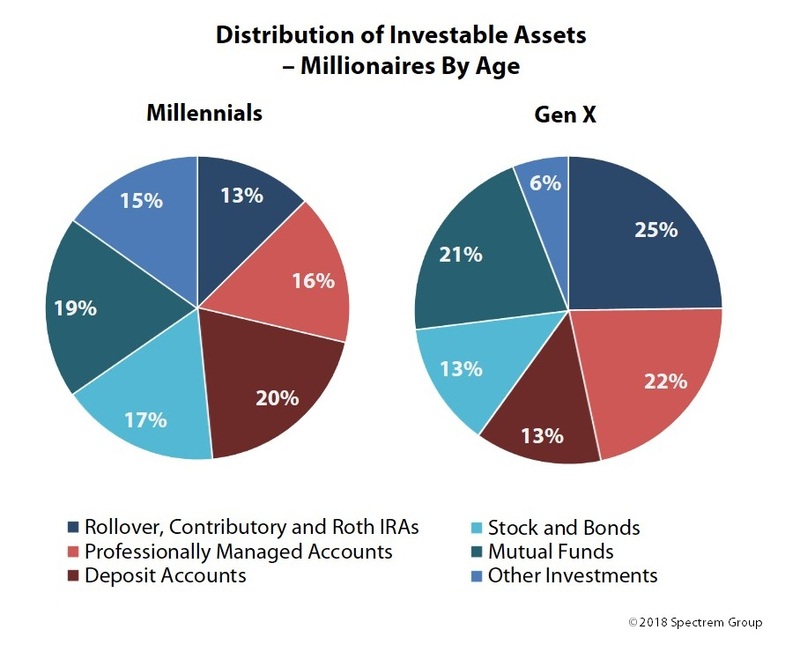 So Millennials have a smaller percentage of their total assets as investable assets. But, among investable assets, there are differences in how that money is parsed based on age of the investor. Twenty percent of a Millennial’s investable assets is in deposit accounts, the safest form of investment. However, 17 percent is in stocks and bonds, and that is higher than the percentages of older investors, who are more likely to have funds in rollover or contributory IRA accounts and professional managed accounts. Again, theses percentage can be expected to change as investors get older. Advisors with Millennial investors can consider when their investors might be prepared to change the allocation of investable assets over time. A higher percentage of Millennial investable assets are in short-term investments but a much higher percentage is in alternative investments. Millennials who are careful with their investable assets are still willing to look outside the standard investment box for profits to grow their portfolio. Another data point from the research which advisors will find most interesting is that Millennials are much more likely to be invested in alternatives such as hedge funds, venture capital and private equity. Obviously, they are also much more likely to need to deal with liabilities such as first mortgages and car loans. Working with Millennials can be an exciting process as they learn what they like about investing and what they don’t like, and consider all the options that come from early investment strategies. Attracting a Millennial client can set an advisor up for an account that can be administered for decades.